Eldridge-Wilde H22 Treatment Facility Utilizes Wet Tap for Stormwater Pollution Prevention Upgrade. 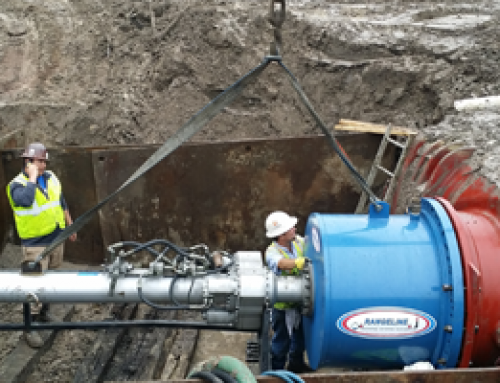 Rangeline Tapping Services recently completed a vital wet tap for Tampa Bay Water. The company wanted to upgrade the Eldridge-Wilde H22 Treatment Facility with their new Stormwater Pollution Prevention Plan and reached out to the professional and fully licensed company to complete the job. Wet tapping involves cutting a hole into an existing pressure main and creating a permanent branch connection while remaining in service. Wet tapping services can be performed under various flow or pressure conditions without interrupting a system entirely. This is something that can only be achieved by a professional team with years of experience and for Tampa Bay Water, Rangeline seemed like the perfect fit for this vital project. The main focus of this important project was to make the Eldridge-Wilde H2S Treatment Facility more environmentally friendly. By doing so, this would eliminate the existing Fluoride Storage Area, the Caustic Injection Pit & Storage Area as well as the Hypochlorite Injection Pit. The new addition created by the Rangeline team made a new bypass piping section on their main 66” Steel transfer pipeline. Rangeline made two 24” Wet Taps to complete these final upgrades to the treatment plant’s desired changes. Wet tapping allows for an upgrade to a pressurized system to be safely incorporated while still under pressure. Rangeline and its professional team created two custom Hot Tap weld-on nozzles with reinforcing collars. The customer first welded them into place to ensure accuracy and Rangeline then installed the 24” Hot Tap valves atop these nozzles. To double check their work, a pressure test was performed on the welds and the gate valves. Next, Rangeline attached their Hot/Wet Tap machine and performed the Wet Taps, all in the same day. Both of these Wet Taps went smoothly and the coupons were both retained and given to the customer for further analysis. For more information on their wet tapping service, visit their official website at www.rangeline.com. Rangeline Tapping Services is a Hot and Wet Tapping, Valve Inserting and Line Stopping Company that works on high-quality professional service projects for its customers throughout North America. Their professional team performs piping solutions for daily or emergency projects on small or large scale project areas. Rangeline and its team use only the latest state of the art equipment and technology to get the job done. This allows them to work across the country on various projects of any magnitude for any type of customer.